We are delighted that you want to volunteer with the Mayor's Alliance for NYC's Animals. 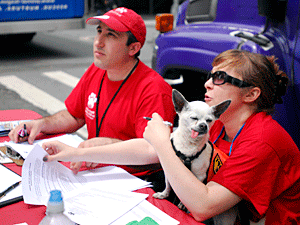 Volunteers are key to our success in saving lives of homeless animals in New York City. Most volunteer opportunities with the Alliance involve helping us at events: Please provide the requested information about yourself in the form below. Once you have submitted your application online, your name will be added to our Volunteers mailing list, and you will be notified by e-mail when volunteer opportunities at our events arise. Note: Due to the nature of the work we do, the Alliance does not utilize volunteers under 18 years of age. What other professional training, experience, and skills do you have? How did you first learn about the Mayor's Alliance for NYC's Animals? I understand that the Mayor's Alliance for NYC's Animals, Inc., does not use volunteers who are under 18 years of age, and I verify that I am 18 years of age or older. I understand that I volunteer at my own risk. I hereby hold harmless the Mayor's Alliance for NYC's Animals, Inc., the Executive Director, the Board of Directors, its employees and volunteers from any claims which could in any way be associated with my services with the Mayor's Alliance for NYC's Animals, Inc., including but not limited to animal bites, accidents, injuries or exposure to parasites or germs. I understand that public relations are an important part of volunteering with the Alliance, and I consent to allow the Mayor's Alliance for NYC's Animals, Inc., to use any photographs taken of me for use in public relations materials. Note: By submitting this volunteer application, you agree to receive e-mails regarding Mayor's Alliance for NYC's Animals volunteer opportunities and news, plus other occasional announcements and action alerts. You Must Complete the reCAPTCHA to Continue! Please only click the "Submit Application" button once and wait for the thank-you page to appear.